So I tried my first Essie. I'd gotten a set of mini's called the Wedding Collection and wanted to first wear Borrowed and Blue, because everyone knows how much I love blue polishes! Well... It was AWFUL! 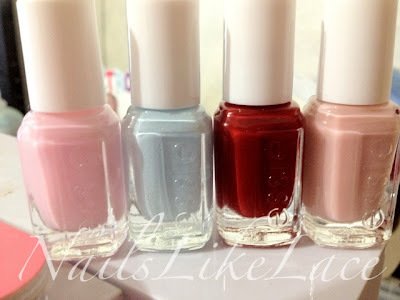 Being a high-priced (any polish over $5 is expensive to me) Essie, I expected it to be a dream but it was far from that. This junk was thick and streaky. Patchy and just had the worst application! It bubbled like crazy, but I was able to smooth that out, for the most part, with top coat. Pretty much the only good thing about this was that it dried pretty fast. But other than that, it makes me really not want to even try the other 3! 'Tis all for today. Do you have any Essie's that you loved or hated?